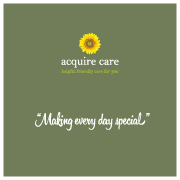 Acquire Care provides helpful and friendly care to adults who need support and help to live in their own homes. It is Acquire Care’s policy to always listen to the needs and wishes of the Client and their family, both at the initial stage and then at regular reviews. The Client is then actively involved in creating the care package that is required. Each care plan is fully adaptable to meet the ever-changing needs of the Client. It is realised that the small attention to detail are important to Clients and therefore it is essential that all wishes and preferences are noted and considered. The Client’s dignity is of prime importance to Acquire Care and all staff receive training in this area. The Client will be asked for the name by which you wish to be addressed and this name will be recorded on the Client’s care plan. This name will be used by all staff. However Clients are perfectly entitled to ask that principal Carers use one name whilst others use another name. In the absence of information to the contrary, staff will address you formally, using your title and surname. All our Carers are trained by Acquire Care in the dedicated office at Shotover Kilns in Headington, Oxford by in- house trainers. All Carers are fully vetted as required by the Care Quality Commission (CQC). This includes the completion of an Independent Safeguarding Authority (ISA) Adult First Check and a Disclosure Barring Services Check. (This was previously known as a Criminal Record Check, CRB). References are also required. Acquire Care’s policies and procedures are written in compliance with the Care Act 2014, Health and Social Care Act 2008 and the Care Quality Commission’s Essential Standards of Quality and Safety. At all times, Acquire Care Ltd. believes that the rights of the Client are paramount.